Introducing the "Gaye Hammond" Rose! Introducing the “Gaye Hammond” Rose! Join us on May 7th at The Arbor Gate Nursery in Tomball (15635 FM 2920) for the unveiling and introduction of the ‘Gaye Hammond’ rose, named after the Houston Rose Society’s Past President. “Without question, rosa ‘Gaye Hammond’ has proven to be the hardiest, most disease resistant yellow rose I have ever grown,” explains its namesake. 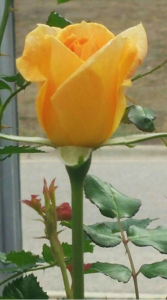 It was an overwhelming honor that its hybridizer, Dr. David Zlesak from the University of Wisconson-River Falls, chose to christen this rose for one of our members. And, like many great landscape roses, she has a great story to tell. 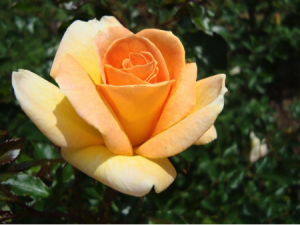 Convinced that the trial of this rose would be short, Gaye planted the stick at the front of a bed so that she would easily see when it died….but it didn’t. In fact, it sprung to life (despite the heat) and within 3 weeks started to bloom. The rose was more vigorous than any bush-type rose Gaye had grown and was constantly covered in bright yellow blooms, even in winter. By the following spring, the bush had matured such that Gaye couldn’t see the rest of the roses in the bed and the plant had to be moved. Excited that there is finally a yellow rose not bothered with our heat, fungal diseases and pests, Gaye called Dr. Zlesak to report on the plant’s performance. The hardiness was validated by folks across the country that, like Gaye were testing the seedling. Since then Dr. Zlesak arranged to put the rose in more formal and scientific trials, including the Earth-Kind Modern Rose Trial sponsored by the Houston Rose Society at MD Anderson Cancer Center’s South Campus and the Biltmore International Rose Trials and it has been a show-stopper at all. In the South, ‘Gaye Hammond’ is a vigorous shrub rose creating clusters of 2-inch blooms throughout the year. Golden orange buds open to bright yellow blooms that are tinged with coral aging in cooler weather to a lemony yellow and finally white. It is self-deadheading with an average mature size of 5 to 6 feet tall by 5 feet wide. There will be limited quantities available for sale on May 7th. Contact the Arbor Gate (281/351-8851) for more information.